"[John Ledyard] was a restless wanderer who needed adventure, which he found on July 5, 1776, when he signed on as a corporal on HMS Resolution, one of two ships that the famed British explorer James Cook was leading to the Pacific Ocean in an attempt to find the fabled Northwest Passage to the Orient. "The passage was never found, but one discovery had a major impact on subsequent events. It began innocently enough in March 1778, when Cook's ships reached the Pacific Northwest coast and anchored in Nootka Sound on the west side of present-day Vancouver Island. The local Indians paddled out to the ships in their canoes, and, according to Cook, 'a trade commenced betwixt us and them, which was carried on with the strictest honesty on both sides. The articles which they offered to sale were skins of various animals, such as bears, wolves, foxes, deer, raccoons, polecats, martens; and, in particular,. 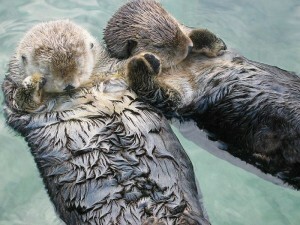 . . sea otters.' Cook's men snapped up the furs to make new clothes to replace theirs, which were in tatters after nearly two years at sea, giving the Indians 'knives, chisels, pieces of iron and tin, nails, looking-glasses, and buttons.' In the coming months Cook's crew would accumulate fifteen hundred pelts in all. "[Trappers] pursued sea otters off the coast of California in one-to three-person, skin-covered kayaks called baidarkas, which were twelve to twenty-one feet long, and less than two feet wide. In this highly maneuverable, shallow-draft watercraft, the natives could stealthily approach sea otters sleeping among fronds of kelp floating at the surface, and hurl a bone-or shell-tipped spear into the animals' flanks, or even club them to death. If the otters were awake, the hunt­ers would form a broad circle around the spot where the otter was last seen, and wait for it to resurface. As soon as it did, one of the baidarkas would rush forward, while the other hunters yelled, the goal being to force the sea otter to dive before it could catch a good breath. The circle would grow ever smaller as the procedure was repeated until the increasingly tired otter was so close that that one of the men was able to kill it. On occasion the natives also used nets to snare the otters, and guns to shoot them. "American sea otter traders made a point of stopping in Hawaii on their journeys across the Pacific to rest, gather supplies, hire natives to work on the ships, and enjoy the seductive charms of island life, not the least of which were the sexual favors freely offered by native women."